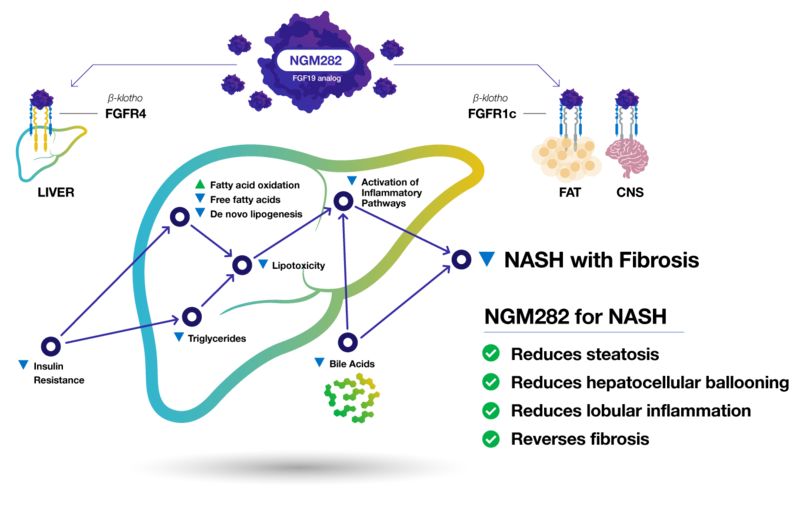 NGM282, an engineered version of human hormone FGF19 has demonstrated the ability to rapidly improve non-alcoholic steatohepatitis (NASH) and reverse liver fibrosis in clinical and preclinical studies. We believe the combination of breadth, magnitude and speed of effect demonstrated by NGM282 in these studies results in an agent that, if ultimately approved, could provide a needed medicine for physicians to treat NASH patients with moderate to advanced fibrosis. NGM282 is wholly owned by NGM, and it is not subject to our collaboration with Merck. View NGM282-related publications and presentations. The estimated global prevalence of NAFLD and NASH has risen rapidly in parallel with the dramatic rise in population levels of obesity and diabetes. NAFLD now represents the most common cause of liver disease in the Western world. In the United States alone, the prevalence of NASH was estimated to total 16.5 million cases and is projected to reach 27 million cases by 2030, with similar trends occurring globally. By 2020, NASH is expected to supplant hepatitis C as the leading cause for liver transplantation, and liver-related deaths in the NAFLD population are expected to increase by more than 150% in the next 15 years. The annual economic burden associated with NAFLD and NASH in the United States was estimated to have been over $100 billion in 2016. NASH is a life-threatening form of liver disease. It results from the progression of nonalcoholic fatty liver disease, or NAFLD, which is a common co-morbidity of metabolic syndrome and obesity. NAFLD is characterized by abnormal amounts of fat in the liver, a condition known as steatosis, and is often associated with insulin resistance. This abnormal fat in the liver contributes to the progression by certain NAFLD patients to NASH by developing a necroinflammatory state in the liver that ultimately drives scarring, also known as fibrosis, and, for many, progresses to liver failure, also known as cirrhosis. There are multiple drivers underlying the development of NAFLD and the pathogenesis of NASH. While non-invasive diagnostic tools are under development, a definitive diagnosis of NASH is currently only achievable through liver biopsy to assess the components of the NAFLD activity score, or NAS. These include steatosis, lobular inflammation and hepatocellular ballooning, a type of cell death. Physicians assess the severity of NASH by liver biopsy using two different scoring systems, the NAS and the fibrosis stage (F0 to F4). The presence of fibrosis is the only factor that is highly predictive in identifying those patients who will progress to cirrhosis. The natural history of NASH is variable from patient to patient and, while the NAS is a valuable tool for diagnosing the disease, it does not appear to be predictive of disease progression. Patients with F2 or greater fibrosis stage have a greater chance of liver-related mortality than cardiovascular-related mortality, and each stage of worsening of fibrosis correlates to an exponential increase in liver-related mortality rates. Most treatment approaches for NASH have focused on the prevention or reversal of liver injury either by predominantly treating the metabolic dysregulation of the disease or through directly targeting inflammatory or fibrogenic pathways. Combination therapy is being pursued by some NASH drug developers, on the theory that the complex underlying pathophysiology of NASH will require targeting multiple mechanisms to achieve a sufficient disease-modifying effect to be clinically relevant. To date, drug candidates with multiple mechanisms of activity have shown the most promising effect on NASH. To our knowledge, NGM282 is the only program in clinical development for NASH directly activating the native FGF19 pathway to drive both a regression of fibrosis and resolution of NASH. The spectrum of activities ascribed to FGF19 appear to be mediated primarily through two different receptor complexes: FGFR4/KLB and FGFR1c/KLB. We believe this tandem receptor-complex activation enables an improvement in the metabolic function of the liver and reduction in bile acid synthesis, which, in turn, enables NGM282 to have a more rapid and direct impact on fibrosis as compared to other agents that only address the metabolic dysfunction of NASH.